In different countries during the last two weeks, three important trade fairs have taken place, at which KRION® was present. At these events, the solid surface from PORCELANOSA Group showed its full potential, being an excellent raw material with great transformation capacity, due to its extensive, beneficial properties for health and its countless applications in the most varied range of projects. From the 4th to the 6th of September, KRION® was present at the 8th Hospital Infrastructure Conference in Chile, whose aim was for attendees to discuss new challenges, needs and policies for healthcare infrastructure. With top level speakers and interesting conferences, the travelling K·LIFE® experience was exhibited to amaze the public with the new generation of the compact mineral KRION®, capable of purifying the air and providing great health benefits. Right afterwards, Maison&Objet opened its doors in Paris from the 7th to the 11th of September, an event for design and the latest trends for the retail and home sector, bringing designers and interior designers into contact with the lifestyle community. 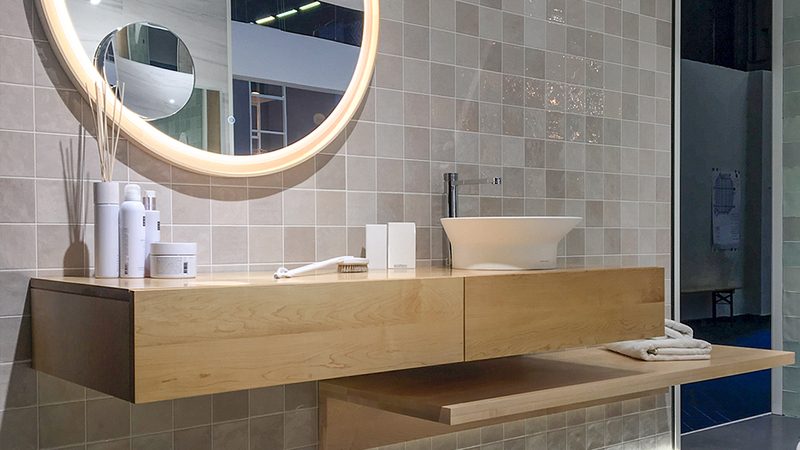 At the PORCELANOSA Group stand, KRION® exhibited two bathroom atmospheres with various pieces from the PURE and TONO collections by Fosters+Partners, as well as a shower screen and shower tray from the KRION® Bath family, all with a modern style perfectly adapted to new trends. Finally, on the 12th and 13th of September, KRION® opened its stand at the Architect@Work The Netherlands trade fair in Rotterdam, where in addition to exhibiting the characteristics of KEAST® technology with K·LIFE®, it showed the different surface finishes of the material, which have no effect on its excellent properties (high fire resistance, antibacterial, joinless, etc. ), prominently displaying sandblasted finishes, rough textures with a different intensity which provide new aesthetic and design possibilities. Next week, the spotlight will again be on CERSAIE 2018 in Bologna, one of the most important events of the year, where KRION® will present new products and an updated catalogue.